Thanks to one of our Fabulous Finders, Taborah has found her bear, but we still have a mailing list of people looking for this bear. I’m looking for a Playskool 1987 BLANKIES Bear No. 5403 SNUZZLES large thumb sucking bear. There is Velcro on the mouth and thumb. 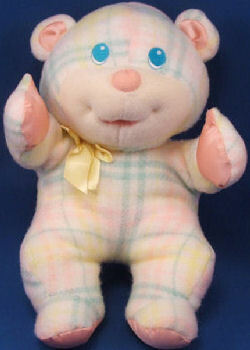 It has a pastel plaid fleece blanket body and pink satin paws and ears. It is wearing a yellow satin bow and has a large PLAYSKOOL flag shaped logo. I originally received this bear from my grandparents for my very first Christmas in 1988 and have loved him ever since. Back in 1999 or 2000 a family friend gave me a ’replacement’, but it was the newer lullaby/ vibrating version, and I just could not stand him. I am 23 years old and still sleep with this bear. I take him with me anytime I don’t sleep at home, and, as a result, he is in pretty poor shape. My god mother has patched him up quite a few times, but I know he will not survive forever. I am hoping to find a new one (or two) soon. If you could assist me with this, I would be eternally grateful. Thanks Lee Ann! I’ve notified the mailing list. Thanks, Miranda. The non vibrating ones do show up from time to time. Our mailing list is not interested in the vibrating one.